If you’re anything like me, you think that the job hunt is a bit of a drag. When you’ve filled out dozens of applications and still receive that dreaded email saying, “We regret to inform you that you have not been selected for the position,” you might feel like giving up. Well, all hope might not be lost. Going to a career fair may be that extra bit of encouragement you’ve been looking for. What’s so special about career fairs? The answer is simple. 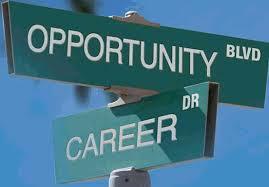 Going to a career fair is the only chance you’ll get at meeting a countless number of employers all in one space. Let’s face it, it’s good practice and the perfect chance to make a great first impression with employers. Making a good impression at career fairs all comes to preparation. The first step is to do your research. After you find out which employers will be at the fair, it is important to find out about them. You never want to tell an employer you’re interested in a job that you know nothing about. Next, you should prepare a thirty-second speech and do some interview prep (which we can help you with here at the Career Center) just in case employers want to give you an interview on the spot. The last thing to do before going to the fair is to print out as many resumes as the number of employers you’d like to meet, and maybe even a few more just in case! So today is the day of the career fair and you have no clue what to wear. Two words, DRESS PROFESSIONALLY! Sorry to say but suits are a MUST. Skirt suits are okay but it should be at or right above the knee. (Keep in mind the length of your skirt while your sitting down.) Wear comfortable but professional shoes being that you’ll be doing a lot of walking around and NO flashy jewelry. Once you’re all dressed and ready to go, it is important to get there early so as to beat the long lines of other people just like you who are waiting to meet employers. Remember to take baby steps — the goal shouldn’t be to get the job, it instead is to get the interview. Lastly, don’t forget to take the employers’ business cards. These will come in handy after the fair and you can also use them to jot down notes about the employer and what you discussed. The mistake that most people make is that they think that once the fair is over, their job is done. It is important to follow up with employers. Remember that business card you snagged at the fair? — well now you can use the employers’ information to send them a thank you card with your own personal touch. It never hurts to evaluate yourself either. If you take the time to reflect on what you can do better, you can go no where but up from here. ← Throw Back Thursday- Take Me Back to Warm Weather!